At the time of the explosion of the Hiroshima bomb, 2 year-old Sadako Sasaki was at home, about 1 mile from ground zero. By some miracle Sadako survived. But by November 1954, chicken pox had developed on her neck and behind her ears. Then on January 1955, purple spots had started to form on her legs. Subsequently, she was diagnosed with leukemia, which her mother referred to as “an atom bomb disease.” She was hospitalized on February 21, 1955 and given, at the most, a year to live. 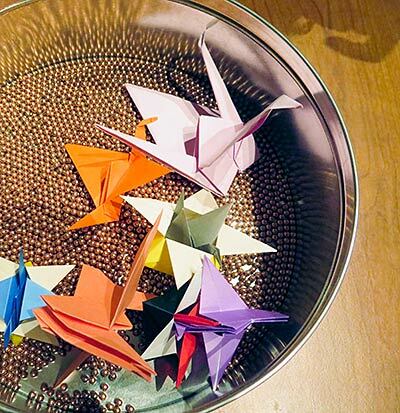 On August 3, 1955, Chizuko Hamamoto — Sadako’s best friend — came to the hospital to visit and cut a golden piece of paper into a square and folded it into a paper crane. At first Sadako didn’t understand why Chizuko was doing this but then Chizuko retold the story about the paper cranes. 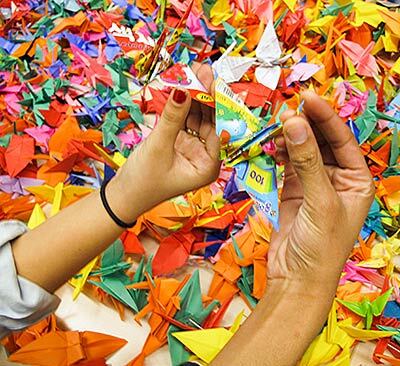 Inspired by the crane, she started folding them herself, spurred on by the Japanese saying that one who folded 1,000 cranes was granted a wish. Ten years after the atomic bomb was dropped on Hiroshima, Sadako Sasaki died as a result of the leukemia. 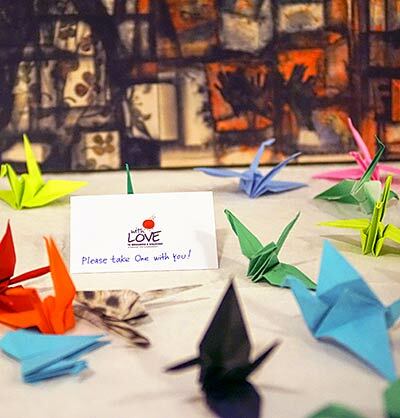 Sadako’s determination to fold one thousand paper cranes, symbolizing her hope for peace and her courageous struggle with her illness, inspired her classmates. After her death, they started a national campaign to build the Children’s Peace Statue in memory of Sadako and the many other children who were victims of the bombing of Hiroshima. To this day, in Hiroshima Peace Memorial Park, the statue of Sadako is beautifully decorated with thousands of paper cranes brought and sent by people around the world. 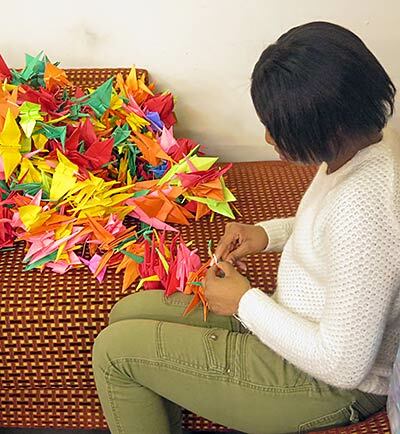 Over the years Hibakusha Stories has been gifted with individual bundles of one thousand paper cranes by the City of Hiroshima to share with the schools we visit. This has been a very moving part of each school presentation, to leave a symbol made by young people in Hiroshima and share the story of Sadako, arguably the most well-known atomic bomb survivor in the world. Through Hibakusha Stories, New York City-based playwright Keith Dale Gordon was able to meet Masahiro and share with him a musical that he has written, inspired by the story of Sadako and Floyd Schmoe, a Quaker activist who tirelessly protested the internment of Japanese Americans during the Second World War and later helped build houses in Hiroshima and Nagasaki in the aftermath of the atomic bombing. Keith’s musical Sadako and Floyd is a moving testament to the power individuals have to change the world, and leave a lasting legacy for peace.